While common usage of the word, text, often refers to written or printed matter, literary and cultural theory extends the term to refer to any coherent set of symbols that transmit meaning to those who know how to read them. In an age where ideas may take many forms and be expressed across different media, texts and reading take on new implications. One goal of the Flows of Reading project is to inspire teachers and students to reflect on what can be considered as reading and what kinds of reading they perform in their everyday lives. 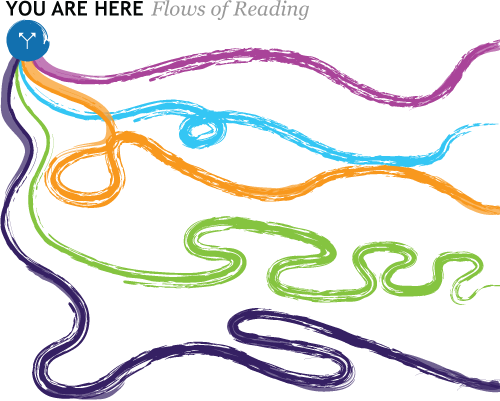 Flows of Reading introduces an expanded concept of the term, text, and models a new type of reader–one who reads across different media and who understands reading as an activity of sharing, deconstructing, and making meaning. Through Flows of Reading, we encourage readers to take ownership of their learning as they select and pursue their own modes of engaging with a text. Each stream models pedagogical and critical techniques that can be adapted to a wide range of literary works and offers teachers multiple examples for putting those approaches into practice. 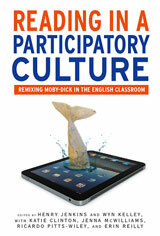 Flows of Reading, a digital book, is a complementary offering to Reading in a Participatory Culture published by Teachers College Press and National Writing Project. You can purchase the printed book here. Discussion of "About the Online Digital Book, Flows of Reading"
Version 82 id 34602 of this page, updated 22 February 2013 by Erin Reilly. Created by Erin Reilly.